Wood burning heaters have com a long way since the days of the old pot-bellied stove. Although you can still get an old-fashioned stove for nostalgia's sake, and they can do an adequate job of heating a garage or shop, they will use more firewood and emit more pollution than a modern wood furnace or heater that uses an advanced combustion process. Wood has several unique advantages when compared to other heat sources. It is a renewable natural resource, unlike propane or natural gas. When firewood is burned, it is "carbon neutral", and does not add any carbon to the natural cycle. Burning fossil fuels releases extra carbon into the atmosphere, which was previously buried deep underground and had effectively been taken out of nature's carbon cycle. When forests are managed properly and high efficiency wood burning heaters are used, they can actually decrease greenhouse gases and global warming. Turning trees into firewood requires very little energy and creates a very small amount of pollution when compared to processing natural gas or propane, or creating electricity. Firewood is also very inexpensive and readily available in most areas of North America. Modern wood stoves are much more efficient than the simple stoves of even just 30 years ago. They use advanced combustion technology to burn the wood more completely. This results in far less smoke and other pollutants being released into the atmosphere, and gets more heat out of the same amount of firewood. 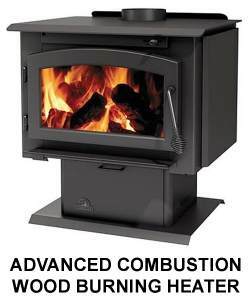 There are basically two types of modern wood stove heaters: catalytic and non-catalytic. The catalytic type uses a catalytic converter in the stove that ignites the particles and gases in the smoke and causes them to burn. This type will provide a more even heat output than other wood burning furnaces, but the catalyst will degrade with use. It must be cleaned periodically, and will need to be replaced every few years. Non-catalytic wood burning furnaces basically create a much hotter fire to start with in order to burn the logs more completely. They do this by using an insulated firebox and feeding preheated combustion air into the fire. This type is more popular today than the catalytic heater. They also produce a beautiful fire that others can't match. These do not require as much maintenance as the catalyst type, but may still need the baffles or other internal parts replaced from time to time due to the extremely high temperatures in the stove. Either type of the modern wood burning heaters can be more than 80% efficient. Studies show that they can get the same amount of heat out of roughly one-third less firewood when compared to older wood stove heaters. They also eliminate roughly 90% of the smoke that is created with conventional wood heaters. Less smoke means less creosote, so the risk of a chimney fire is greatly reduced, and the chimney will not need to be cleaned as often. Many incorporate blowers that will distribute the heat throughout the garage very efficiently. There are several disadvantages to heating with wood, though. It is definitely less convenient than other types of heat. This is not a "set and forget" option! Other heaters with thermostats can be set to turn on if the temperature drops below a certain level so water pipes or other liquids in the garage don't freeze. Not so with a wood heater. These require effort and attention. You have to obtain firewood, store it, and add it to the stove. Wood burning heaters take a little while to warm up, so you don't have the near-instant heat that is provided by other types. Most also require manual adjustments to be made as the fire gets going. The up front cost of an advanced combustion wood burning furnace is higher than electric, natural gas, or propane garage heaters. Low-efficiency stoves can be cheap (you can even make one from an old 55-gallon drum), but the effort and cost involved with using more firewood is just not worth it in the long run. A wood burning furnace also takes up precious floor space in the garage - you can't hang one from the ceiling like you can with other types. Your garage must also be able to accommodate a chimney or flue pipe. It can be difficult and expensive to add one to an existing garage that wasn't designed for it. It can be difficult to regulate the heat output - you can't just turn down the thermostat or turn it off if it gets too hot in the garage. The surfaces of the heater will also be very hot, so you have to keep a clear area around the stove. There is a risk of getting burned if you aren't paying attention, or if children happen to be playing near it. However, a wood burning furnace can be the most economical choice for the right person and situation. If you have access to an inexpensive firewood supply and you don't mind the attention and effort that wood burning heaters require, there really isn't any more economical way to heat a garage. Make sure that the wood heater you buy is an advanced combustion type and is EPA Certified - it really is worth the extra money up front in order to use one-third less firewood going forward. For information on other types of heaters, go to our Related Pages menu on the right near the top of this page. For more in-depth information about wood burning heaters, www.WoodHeat.org is an excellent resource.